Celebrities have great influence. Ms. Jolie’s experience may cause many women to choose radical surgical treatments, but President Bill Clinton’s experience with reversing his poor health (and heart disease) by changing his diet sent millions more people towards a very conservative course. We need more positive examples....Sexism is rampant in the medical businesses. Conservative treatment (including a “doing nothing approach” called “watchful waiting”) has been a standard recommendation for men with prostate cancer for more than 20 years. Mutilation, has been, and still is, universally recommended for women, even with the slightest hint of pre-cancer of the breast (DCIS). I have no intention of criticizing the famous actress, Angelina Jolie, for her decision to have both breasts removed in an effort to improve her chances for a longer life. (National headlines on May 15, 2013.) I have treated nearly a thousand people with breast cancer over my 45-year career in medicine. From my experience, I can safely say that she has agonized over this decision. Her radical treatment may have helped her; time will possibly tell. [All we know for sure is that Ms. Jolie has made a great sacrifice today for a theoretical benefit in the very distant future—say one to five decades henceforth.] If she develops breast cancer then we can assume this prophylactic treatment failed. If the cancer never appears there are two possibilities: one, she may never have been destined to grow, or die of, breast cancer—in this case a double mastectomy would not have been necessary. The other possibility is that the treatment saved her life. Neither disease-free outcome can be proven for her as an individual. Women (and men) are willing to make almost any sacrifice to avoid premature death and suffering. This tells me that the effort required to eat a better diet is no real obstacle. Switching from braised beefsteak to Mary’s Tunisian Stew (found in The Starch Solution) is no sacrifice at all—especially when compared to a double mastectomy. Breast, prostate, and colon cancer are due to an unhealthy diet—and so are type-2 diabetes, obesity, and coronary heart disease. 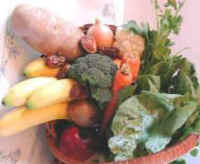 Unfortunately, few people are given the information needed to take advantage of a simple, cost-free, dietary solution. Profit drives health messages. One woman’s double mastectomy generates more than $50,000 in medical business. Dietary change cuts the food bill in half. People do not save themselves with a healthy diet because no doctors are prescribing it, no hospitals are serving it, and no Fortune 500 companies are selling it. Left unchecked by a few honest doctors, scientists, and politicians, profiteering would lead to medical recommendations to cut a smoker’s risk of lung cancer in half by having one lung prophylactically removed (rather than cost-free smoking cessation). Prostate cancer occurs in nearly 100 percent of men by age 80 years. So why not recommend total prostate removal on every man’s thirtieth birthday? Sexism is rampant in the medical businesses. Conservative treatment (including a “doing nothing approach” called “watchful waiting”) has been a standard recommendation for men with prostate cancer for more than 20 years. Mutilation, has been, and still is, universally recommended for women, even with the slightest hint of pre-cancer of the breast (DCIS). Even those women fortunate enough to avoid breast amputation (a mastectomy), are universally harmed. They are all persuaded into receiving breast, lung, and heart damaging radiation, when a simple (in most cases non-deforming) lumpectomy alone would suffice (even for women with invasive breast cancer). Celebrities have great influence. Ms. Jolie’s experience may cause many women to choose radical surgical treatments, but President Bill Clinton’s experience with reversing his poor health (and heart disease) by changing his diet sent millions more people towards a very conservative course. We need more positive examples. Shining light on a subject will reveal the truth. With mastectomy back in the headlines, stories should again be told about how more than sixty years of medical research has unarguably shown no survival benefits of mastectomy or lumpectomy with radiation, over a simple removal of the lump. As a result of this science more than 18 states in the US have “informed consent laws” that force physicians to tell women facing breast cancer tests and treatments the facts about the failure (and benefits) of breast cancer treatments. In the state of Hawaii where I helped get the 3rd informed consent law passed in the US, women have also been told by state law since 1982 that they need to change their diet. I applaud Ms. Jolie for making her story public. I do hope her life has been prolonged by this radical surgery. I would, however, discourage this approach for my patients, because I believe the harms far outweigh the benefits. Irrespective of any decisions about mastectomy, or any other medically prescribed treatments, all women and men need to have the opportunity to benefit from a starch-based diet. In 1984, I performed the first study ever published in a medical journal showing the benefits of a healthy diet for women with breast cancer (the McDougall Diet). Since then, dozens of other scientific papers have come to similar conclusions. Yet, doctors rarely mention the importance of food, as they send their patients off to therapies that they (in fact) know will have disastrous consequences. For better understanding and scientific support read The McDougall Program for Women and McDougall's Medicine - A Challenging Second Opinion (found in libraries and downloadable from my web store-www.drmcdougall.com). Also see my Hot Topics on breast, prostate, and colon cancer (www.drmcdougall.com).